The official website confirms the yellow-red flag. Also shown as «National Flag of State of Mwali» at this page. In the (trustworthy?) site of a French-speaking journalists’ association, I found confirmation for this. (We’re now left to find out whatever happened to the black and yellow flag with white crescent and star, and to the yellow flag with red star.) The colour yellow is still “Mwali’s color”, as reflected by the four stripes of the national flag. The actual local flag now of Moheli in the Comoros under the new Union constitution is the same yellow-red flag used during the brief secessionist period. Oddly enough, it seems that the bicolor flag, once used by separatists, has become a sign of official allegiance to the central power, so that separatists have moved to the starry flag to express their claims. Not unlike, say, Puerto Rico (cp. current and former separatists). I am just coming back from Moheli island, and I can tell you that the yellow and black flag displayed on many websites is false: I can swear that the flag was yellow with red star. 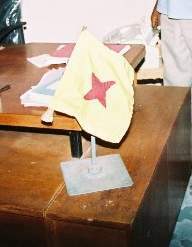 Hand sewn (incorrect) flag in the office of the MAMWE (Electricity and Water Company) Director (star with 4 branches instead of 5). I saw it at the director’s desk, a hand made flag of Moheli. But he admitted that his wife forgot a branch of the star when sewing this flag. It seems that after all the official version of Mwali’s red star has in fact 4 points. In the KweliMag website we see a photo of the new president of the island wearing the presidential sash (yellow with a 4-pointed red star). I find it hard to believe that the star on the sash can be different from the one used on the island flag! It shows the newly elected president (July 2007) Mohamed Ali Said wrapped in four-pointed flag. I came across with an interesting page about Mohéli/Mwali. This is website of Mwali International Services Authority (MISA), which is frequently updated (latest news put in January of 2010). It says that black-yellow flag with crescent and star has been adopted in 2002, stating that this is current flag of Mwali. Flag depicting on this page is slightly different than previously reported. Black stripe is narrow, and horn of crescent is short. The crescent and star emblem is small and slightly placed near to fly. According my references, the flag is vertical dark and yellow (dark about 1/4 of the flag) probably black and yellow. Some info appear in Flag Report 36 [frp]. 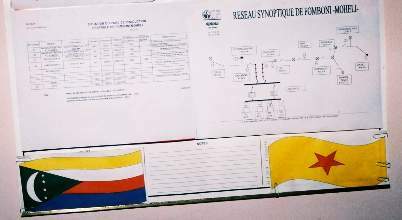 Apparently, the island constitution of Mwali (Moheli) says nothing about flags; no “drapeau” nor “emblème” in this page. It seems that the self-proclaimed Democratic Republic of Mwali lasted only from 11 to 28 August 1997. The flag used by Fatima Djumbe is shown by Calvarin [clv02]: it was yellow and red, not yellow and black. The flag of Grande Comore can be seen on all official buildings in Moheli, because the island is also the head of the union and there is a conflict between the island and the union governments. A few home-made French flags have been hoisted on electricity poles, together with the Moheli flag, yellow with a red star.